Hebrew word for possessor or owner of an object. In connection with many nouns, it expresses some relation between the person and an object. Many of these combinations are found in Bible phraseology, and are still used, especially among the Polish-German Jews; e.g., "Ba'al ha-Bayit" (master of the house), corruptly pronounced "Baalboos." In the idiom of the Talmud the words compounded with Ba'al that are especially used to designate the different classes among scholars are: "Ba'ale Gemara," or "Ba'ale Talmud," those versed in the Talmud; "Ba'ale Miḳra," those versed in the Bible; and "Ba'ale Mishnah," those versed in the Mishnah. Other compounds with Ba'al adopted from the Talmud, and still frequently used, are: "Ba'ale Ḥayyim," animals; "Ba'al Din," opponent, the plural being "Ba'ale Din [in]," those engaged in a lawsuit; "Ba'al Teshubah," the repentant sinner; "Ba'al Yesurin," one afflicted with pain; "Ba'al Mum," one having a bodily defect; "Ba'al 'Eẓah," counselor. 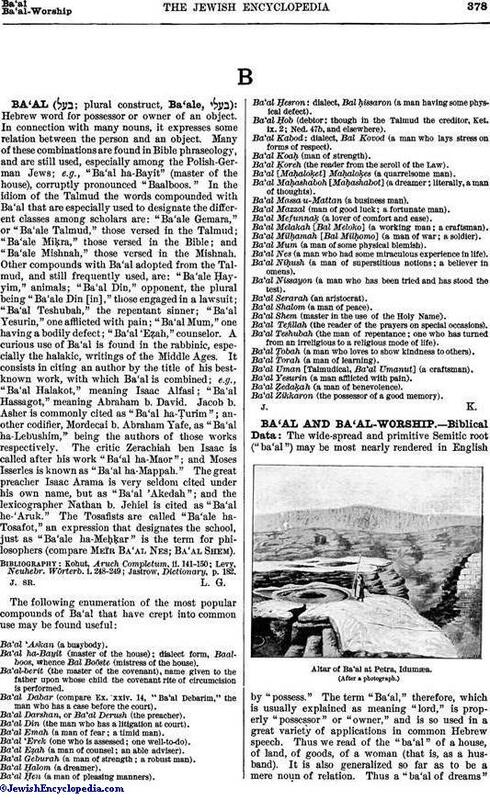 A curious use of Ba'al is found in the rabbinic, especially the halakic, writings of the Middle Ages. It consists in citing an author by the title of his best-known work, with which Ba'al is combined; e.g., "Ba'al Halakot," meaning Isaac Alfasi; "Ba'al Hassagot," meaning Abraham b. David. Jacob b. Asher is commonly cited as "Ba'al ha-Ṭurim"; another codifier, Mordecai b. Abraham Yafe, as "Ba'al ha-Lebushim," being the authors of those works respectively. The critic Zerachiah ben Isaac is called after his work "Ba'al ha-Maor"; and Moses Isserles is known as "Ba'al ha-Mappah." The great preacher Isaac Arama is very seldom cited under his own name, but as "Ba'al 'Akedah"; and the lexicographer Nathan b. Jehiel is cited as "Ba'al he-'Aruk." The Tosafists are called "Ba'ale ha-Tosafot," an expression that designates the school, just as "Ba'ale ha-Meḥḳar" is the term for philosophers (compare Meïr Ba'al Nes; Ba'al Shem). Ba'al ha-Bayit (master of the house); dialect form, Baalboos, Whence Bal Boöste (mistress of the house). Ba'al-berit (the master of the covenant), name given to the father upon whose child the covenant rite of circumcision is performed. Ba'al Dabar (compare Ex. xxiv. 14, "Ba'al Debarim," the man who has a case before the court). Ba'al Darshan, or Ba'al Derush (the preacher). Ba'al Din (the man who has a litigation at court). Ba'al Emah (a man of fear; a timid man). Ba'al 'Erek (one who is assessed; one well-to-do). Ba'al Eẓah (a man of counsel; an able adviser). Ba'al Geburah (a man of strength; a robust man). Ba'al Ḥen (a man of pleasing manners). Ba'al Ḥesron: dialect, Bal ḥissaron (a man having some physical defect). Ba'al Ḥob (debtor: though in the Talmud the creditor, Ket. ix. 2; Ned. 47b, and elsewhere). Ba'al Kabod: dialect, Bal Kovod (a man who lays stress on forms of respect). Ba'al Koaḥ (man of strength). Ba'al Ḳoreh (the reader from the scroll of the Law). Ba'al [Maḥaloḳet] Maḥaloḳes (a quarrelsome man). Ba'al Maḥashaboh [Maḥashabot] (a dreamer; literally, a man of thoughts). Ba'al Massa u-Mattan (a business man). Ba'al Mazzal (man of good luck; a fortunate man). Ba'al Mefunnaḳ (a lover of comfort and ease). Ba'al Melakah [Bal Meloko] (a working man; a craftsman). Ba'al Milḥamah [Bal Milḥomo] (a man of war; a soldier). Ba'al Mum (a man of some physical blemish). Ba'al Nes (a man who had some miraculous experience in life). Ba'al Niḥush (a man of superstitious notions; a believer in omens). Ba'al Nissayon (a man who has been tried and has stood the test). Ba'al Shalom (a man of peace). Ba'al Shem (master in the use of the Holy Name). Ba'al Tefillah (the reader of the prayers on special occasions). Ba'al Teshubah (the man of repentance; one who has turned from an irreligious to a religious mode of life). Ba'al Ṭobah (a man who loves to show kindness to others). Ba'al Torah (a man of learning). Ba'al Uman [Talmudical, Ba'al Umanut] (a craftsman). Ba'al Yesurin (a man afflicted with pain). Ba'al Ẓedaḳah (a man of benevolence). Ba'al Zikkaron (the possessor of a good memory).